So today starting around 11:21am EST I received about 22 emails from Zazzle informing me that my t-shirt designs with the mathematical symbol PI were being removed due to copyright infringement. At first I thought it was a mistake, maybe even a joke. You can not copyright a mathematical symbol. Right? Just not possible. It is used in every day text. It is a symbol used not only in math but in Greek writings and in the names of fraternities and sororities. What about Pi Day? You just can’t trademark the Pi Symbol- that would be absurb right? This left me scratching my head and I am sure in the next 48 hours there will be plenty of other Zazzle, Cafe Press, Etsy and other online store owners who will be doing the same. So.. I did some research. 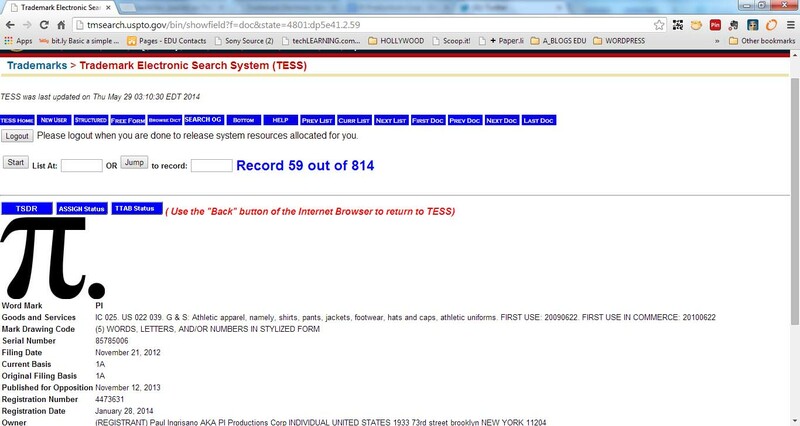 I visited the United States Patent and Trademark Office at: http://www.uspto.gov and looked up the U.S. Registration No. 4473631 Serial # 85785006 AND GUESS WHAT! 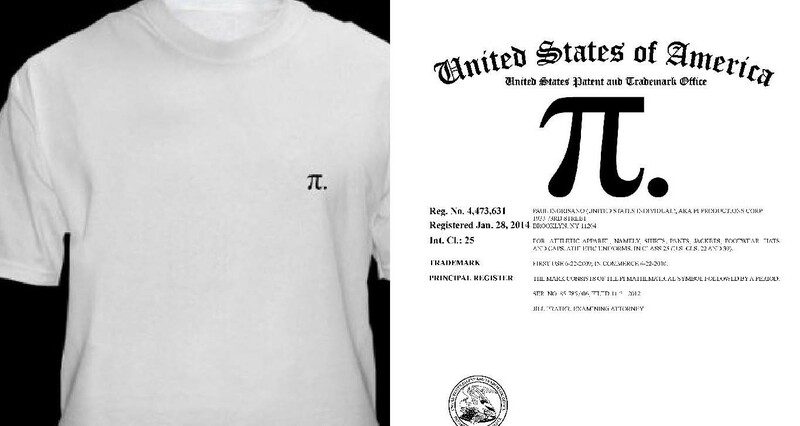 The Pi symbol is trademarked…… BUT WAIT.… “The mark consists of the pi mathematical symbol followed by a period.” The pi symbol is NOT trademarked by itself (EXACTLY what I KNEW I would find) The image to the right shows a screenshot of the United States Patent and Trademark Office website with Pi (and period) symbol. I have included the information that was included on the page in the table below. If you visit the site there is a lot more information including documents and the timeline that it took to get the trademark (starting in 2012) It also includes a “Specimen” of how the symbol will be used. This “Specimen” is a white T-shirt with the Pi symbol followed by a period. There is also a certificate for the trademark which clearly identifies the PI and the Period. Description of Mark Color is not claimed as a feature of the mark. The mark consists of the pi mathematical symbol followed by a period. So All of the designs that I had up on Zazzle as well as many of my fellow Zazzlers such as JEZ were not actually infringing on this trademark. None of my designs have a period. I wonder who at Zazzle made this decision. I wrote to Zazzle and explained to them the situation however I doubt that Zazzle will reinstate any of the designs and based on the TradeMark Manual of Examining Procedure someone will probably have to challenge this in court! Which is ridiculous! Oh and by the way Zazzle is just one of 1,000 of sites with PI related apparel and gifts. Just do a google Search. Let’s just see where this goes over the next few days! This brings me to the reason the registrant did this. (Oh I am sure he is enjoying every bit of this) He or someone from Pi Productions had to report each and every design that is up on their site and ask Zazzle to have them taken down. BUT WHY? Well the simple answer is now the registrant can turn around a be the SOLE seller of apparel with the PI symbol. THAT IS JUST CRAZY! A MONOPOLY ON PI? REALLY? IT IS A MATHEMATICAL SYMBOL!!!! SO.. who is the registrant? The registrant of this trademark is Paul Ingrisano AKA PI Productions Corp. His personal page can be found on Facebook here and you can on the left how he is using the PI symbol. Funny that there is no PERIOD. His company Pi Productions can be found on Facebook here. The page is all about music and nothing about apparel. His Linkedin profile is indicates that he works at Pi Apparel yet no link to said business. His Etsy shop called PI314US is opened and uses a PI symbol as it’s avatar – but sells no PI related items. It was opened this past March. His Twitter Account has been inactive since 2012. So what are all of us with Pi apparel designs do NEXT? Ha, his facebook page is now not available. Gee I wonder why? Folks… we ALL need to submit the information needed to get our images reinstated. And for that last part? Here is what I sent zazzle. Problem is… even IF Zazzle puts our images back, will they be able to restore their ranking in google? Any comments or feedback? Links to other sites are now broken. Not to mention all the wasted time while they are not even available for sale. Someone needs to sue this moron. Zazzle and Cafepress aught to lead the march as they got hurt more than any of us little guys. I would love to know just how many designs got pulled. And put together a web page showing them all. Anyone interested post here. Or contact me through my own site if you would rather. Here’s mine. Note; NO period and… one of my designs uses Times New Roman as the font. SAME AS HIS. Only his claims to be “stylized.” It is not. My round version was hand drawn. So not even the same type face. There is no reason what so ever these got pulled. Jenny! Thanks for the comment. This is crazy. We do need to start a page! Contact the Electronic Frontier Foundation – eff.org – seriously, tell everyone affected by this to do so, and actually contemplate getting them involved in legal action against this dipstick. This is right up their alley, and a matter that affects us all. Don’t just get pissed and do nothing when stuff needs to be done. How can we sink this guy?